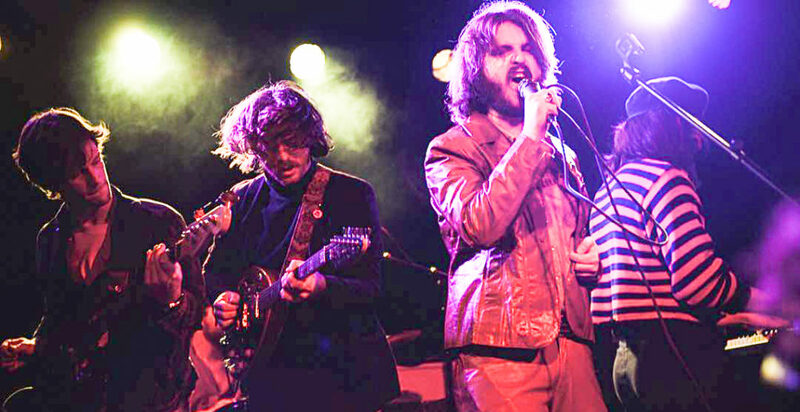 Most Tech students have probably never heard of the Los Angeles psychedelic rock band Hearty Har. Still, based on the group’s pedigree alone — Shane and Tyler Fogerty, two of the band’s members, are the sons of rock legend John Fogerty of Creedence Clearwater Revival — it is hard not to want to give them a listen. The Technique recently had the chance to speak with the members of the group before their performance at the Super Bowl Live concert series. According to the event coordinator who set the interview up, he had never even heard of the group. In a makeshift media lounge set up behind the stage in Centennial Olympic Park, the five guys making up Hearty Har sat around a plastic folding table, clad in what could only be called vintage thrift chic. They had yet to transform into the jewel-toned gentlemen they became later on, reflective rhinestone embellishments glinting stage lights and the bright Atlanta skyline back to the crowd. While brothers Shane and Tyler Fogerty did most of the talking, it was obvious that there was no one spokesperson for the band. They were just a group of friends hanging out and getting excited for their upcoming gig. Drummer Will Van Santen had joined the duo in high school, while keyboardist Doug Lamothe and bassist Marcus Högsta came into the picture in college. On February 1, at 12:00 a.m., Hearty Har released “Calling You Out” on all of their media platforms. That night, they played the never-before-performed song for the attendees for the Super Bowl Live concert series, put on by the city of Atlanta. This song, the release of which was timed specifically for their Atlanta performance, is part of a larger album coming out between late March and early April. At the beginning of their thirty minute set, a dispersed number of people casually listened in. By the second song, a crowd of people had formed around the stage. Verizon VIP members recorded the band from the very front, while others lined up along the gate to get as close to the band as possible despite the eardrum-shattering volume levels. The band’s music is exceptionally unique. A contemporary mix of rock and electronic psychedelia, the music was both audibly pleasing while also managing to rile up the crowd. The songs brought a tangible energy to the crowd, from the strum of the electric guitars to the keyboards jamming along to Tyler and Shane’s lyrics. When their final song, “Psycho!,” was played, the obvious influence of the Beach Boys had several people in the crowd swing dancing along to the song. Based off the energy in the air and the reaction of the crowd to each subsequent sound, Hearty Har certainly lives up to the vision which the Fogerty brothers have set for it.